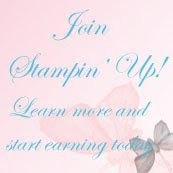 I can hardly believe Stampin' Up! convention is already over. It went by so fast!. 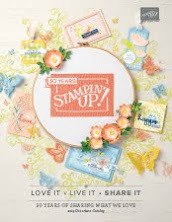 I'm so excited about all the new kits and the Stampin' Up! Holiday catalog we were able to see and buy from right at the show. I'll be busy making samples until the official launch of the catalog to customers on August 28, 2014. Meanwhile, here are the three swaps I did for this year's event. Stay tuned over the next few days as I show you some of the fantastic swaps I received in return. The Stampin' Up! 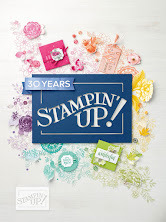 annual catalog went live in June, and I'm playing with all the new rubber stamp sets, polymer set, which I'm beginning to favor more and more, new punches, dies, and embossing folder. Here's the recipe for my first Convention swap card. The Stampin' Up! annual catalog went live in June, and I'm playing with all the new rubber stamp sets, polymer set, (which I'm beginning to favor more and more), new punches, dies, and embossing folders. Sherri is displaying her gorgeous face painting from the Awards night after-party. This raised flower card was a third swap card I made for Convention. I used this one for Lyssa’s Convention 2014 “Now This is convention Quality” Swap. As usual, the swaps from this swap were wonderful. I brayed White velum card stock with Pink Pirouette. Once dry, I used the Flower Frenzy Bugz L Die to cut the flowers. I creased from just about the center of the flower to the tip of the petal with a bone folder and then pinched the velum card stock together giving it a slightly raised effect. The center was held together with a Candy Dot Brad Base with a Pearl in the center. I was able to cut several flowers at once using the Big Show die. 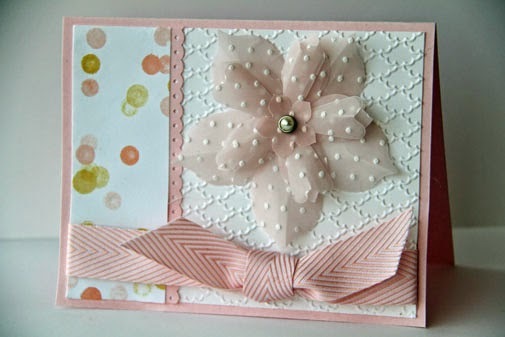 Then all four of the cut flowers used to make one flower fit into the Perfect Polka Dots embossing folder for a single run through the embossing machine. I attached the flower to the Whispers White layer before mounting to the Pink Pirouette layer so the brad back was hidden. Take a look at a few more swaps and card samples from the convention display boards on the photos link in my Meetup site. Lyssa has so much fun at her own swaps. . .and she was honored with many awards this year including Founder’s Circle! Yeah Lyssa! Paper Pumpkin kits are going to be even more exciting! These once-a-month kits offer even more value, with precut papers and accessories included, giving you everything you needs (except the usual scissors, glue, etc.) to make cute projects that you’ll be excited to use for birthdays or gifts. 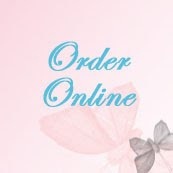 Order month to month, or save money by signing up for a monthly subscription. I'm thinking about hosting a monthly Snack, Chat and Craft meetup for ladies who want to get together and make the Stampin' Up! monthly Paper Pumpkin kit. Let's share ideas for ways to use the kit other than the standard way the kit is configured. Any interest? Sign up for my mailing list or leave me a comment below. Don't receive your monthly Paper Pumpkin kits yet? Sign up between now and Sept 10 and get your first two months at 50% off. Shipping is free. With fall / winter holidays right around the corner, Stampin’ Up! is introducing two more kits – both coming with the Holiday mini catalog at the end of August. U.S. Demonstrators can begin pre-ordering items 1-August-2014. One Halloween wreath kit and the other is a Watercolor Winter Card Kit – two super-fun projects. These on page 36 and 37 when you receive your copy of the new Holiday Mini catalog next month, if you’re one of my regular customers. If you don’t have a U.S. demonstrator and need a copy of the holiday mini catalog, send me a quick note before the end of July so I can add you to my catalog mailing list.